Appearance: Alexis is a average height of 5"4' that has a slimy, but a strong body though it doesn't look it,She weights about 130 to 140 pounds. She has long, red hair that she keeps pulled up into a pony tail, so when she works it won't get in her way. With that her eyes are a sky blue color, as well as her skin is fair and soft with freakles lining most of her limbs and back due. 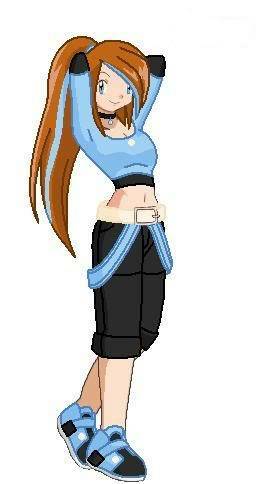 Her normal wear is a blue or red t- shirt that comes to above her belly botton, with a long black sleeved shirt linging under it, She black capri type pants, with a white belt and tight dark type running shoes. Personality: Alexis is a relatively a calm,collective type person when she is working or out alone, but when it comes to being around people she cares about or with friends, her personality switches a bit. She then is a loud, but happy, bold type person this also appears when she is in a battle or challegen. She knows her way around making a pokemon happy and treating them with care, she seems to be able to read what they thinking at times. Which is not too weird since she tends to spend alot more time around her pokemon and others at the day care center helping caring for them. Biography: Alexis Hatfield was a young, straving trainer that lived in Mauville City. She had been living their with her grandparents since she was a little over a year old, ever since her parents passed away,being murdered by a stranger while out traveling the roads one winter night. It didn't really phase her much since she was so young, she could remeber them, nor really know what they looked like besides the pictures she was showen.As Alexis got older, her grandparents are her a part-time job with their neighbors that worked the daycare center across from them. She worked with the pokemon, though learning how to treat them and know what they need before they do was kind of hard to do, but she learned from the best though as she thought. One day, she found an blue egg that one of the pokemon given birth too, having given it to the daycare man he tried to give it to the trainer that the pokemon belonged too, but the trainer had no room or time to raise another egg pokemon. Having not knowing what he would do with it, he asked if Alexis would raise it, she happily agreeded too, when it hatched she suprisingly found a Azurill. Ever since it was hatched Azurill had taken a close bond to her, mainly having thinking she was her mother, since it was a baby still yet, though not too long before that she was given a Charmander by her grandmother as her first pokemon. Ever since she started she started working for the daycare keepers, she been working towards on being a breeder, but when she saw that egg and given her first pokemon, she automaticly then had the ambition to become a famous pokemon breeder, so from then on she set out on her advanture to acheive her dream. Meet: Taken in and healed from being neglected by a trainer.